Lackawanna College, a two-year college in Scranton, Pa., has become a prostitute. The administration doesn't think of themselves or their college as a prostitute. They believe they are doing a public service. Of course, streetwalkers and call-girls also believe they are doing a public service. Lackawanna College's price is $2.5 million. That's how much Cabot Oil & Gas paid to the School of Petroleum and Natural Gas, whose own nine-building campus is in New Milford in northeastern Pennsylvania. On the School's logo are now the words, "Endowed by Cabot Oil & Gas Corporation." That would be the same Cabot Oil & Gas Corporation that has racked up more than 500 violations since it first used horizontal fracking to extract gas in the Marcellus Shale almost six years ago. That would be the same company that was found to be responsible for significant environmental and health damages in Dimock, Pennsylvania. It's the same company, fronted by four lawyers, that managed to keep a peaceful grandmother anti-fracking activist not only off its property, but away from Susquehanna County's recycling center, a hospital, grocery stores, restaurants, and 40 percent of the county where Cabot has mineral-rights leases. Several major gas and oil companies and suppliers--including Anadarko, BakerHughes, Chesapeake Energy, Halliburton, Noble Energy, Southwestern Energy, Williams Midstream, and others--have also contributed scholarships, equipment, and funding to the School. The School's mission includes creating "a campus that is focused and dedicated to the oil and gas industry." 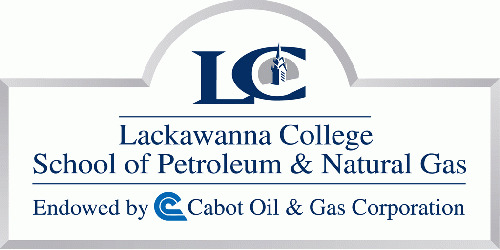 Lackawanna College proudly claims its Cabot-endowed School is "focused on its vision of becoming a nationally-recognized, first in class program in the field of petroleum and natural gas technology." There is no question the School is fulfilling its promise. A $500,000 outdoor field laboratory simulates a working gas field; all students are required to complete internships. Richard Marquardt, the School's executive director, has B.S. degrees in petroleum engineering and business management, as well as a long history of work in the industry. The eight other full-time faculty also have engineering degrees and significant industry experience. Fifteen adjunct faculty also have significant industry experience. By Fall semester, the School will have about 150 full-time students. Students major in one of four programs--petroleum and natural-gas technology, natural-gas compression-technology, petroleum and natural-gas measurement, and petroleum and natural-gas business administration. Admission to the School's rigorous academic programs "is highly competitive," with students needing a strong science and math background prior to acceptance, says Marquardt. The students earn an associate in science degree upon completion of the two-year program. "It is focused on a very specific market," says Marquardt, providing personnel at a level between the vocational training programs and the B.S. engineering programs. The placement rate is over 90 percent, says Marquardt.